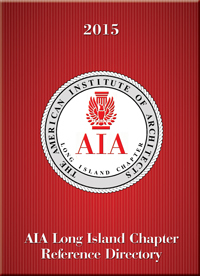 The AIA Reference Directory is distributed to top architects throughout the Long Island, Queens and Brooklyn Region. This highly respected directory is published by the American Institute of Architects and SPC Marketing Company. For an entire year, readers of this directory will take advantage of the most comprehensive reference directory available to Architects on Long Island. The directory lists all AIA members, municipal building department officials and other regulatory agencies that inspect and oversee the architectural trade and construction industry. Your company is invited to promote its goods and services to top architects over the next year with high-impact display advertising. Call now for best positions! Distributed to Long Island's Most Successful Architects and Architectural Firms. Your company is invited to advertise its goods & services to Long Island Members. There's an Advertising Program to fit Every Company's Ad Budget.